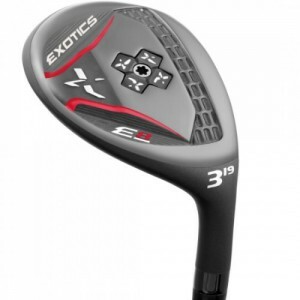 Tour Edge Golf’s E8 series hybrid is the first adjustable hybrid in the company’s popular Exotics line. Tour Edge says the E8 hybrid features a maraging steel cup face that engineers made thinner to establish even faster ball speeds off the face. The face technology also includes variable face thickness that Tour Edge said increases the spring-like effect across more areas of the face. Focusing on a faster ball speed and less spin, Tour Edge said its engineers positioned E8’s center of gravity slightly lower closer to the face. Engineers also revised the Power Grid design, the company said, making it smaller to obtain maximum flexing at impact, increased spring-effect, and more distance. Deep cut away steps positioned back in the heel and toe of the sole, according to Tour Edge, make shaping shots off the tee and the turf easier than ever for players of all abilities. The E8 incorporates trajectory control, Tour Edge said, courtesy of an adjustable sole weight. The club comes standard at nine grams – three grams heavier than the E8 driver – changing the trajectory control. The company said E8 hybrid utilizes the same weight kit as fairway wood and includes six-gram, 11-gram, and 14-gram weights, kit-$49.99. Individual weights are available for $19.99. The E8 hybrid (suggested retail price $199.99), available in October, will come standard with a UST Mamiya Recoil shaft and will have loft options a 2 hybrid (17 degrees), 3 hybrid (19 degrees), 4 hybrid (22 degrees), 5 hybrid (25 degrees) and 6 hybrid (28 degrees).